There's no doubt you won't be missed when you step out in this eye-popping neon orange! Available in 7 styles of increasing length & coverage. Check out the photos to see front, side, & rear views of each. * Squarecut. A very popular, masculine style. * Boxer. Extending to mid-thigh. All 7 styles are unlined, without messy exterior drawstrings. Elastic waistband. All except boxer and board come with a roomy and comfy front pouch that holds and accentuates a man's natural assets. Boxer and board have an interior drawstring. Please be aware there's a seam down the center front that sometimes doesn't show in the product photos. 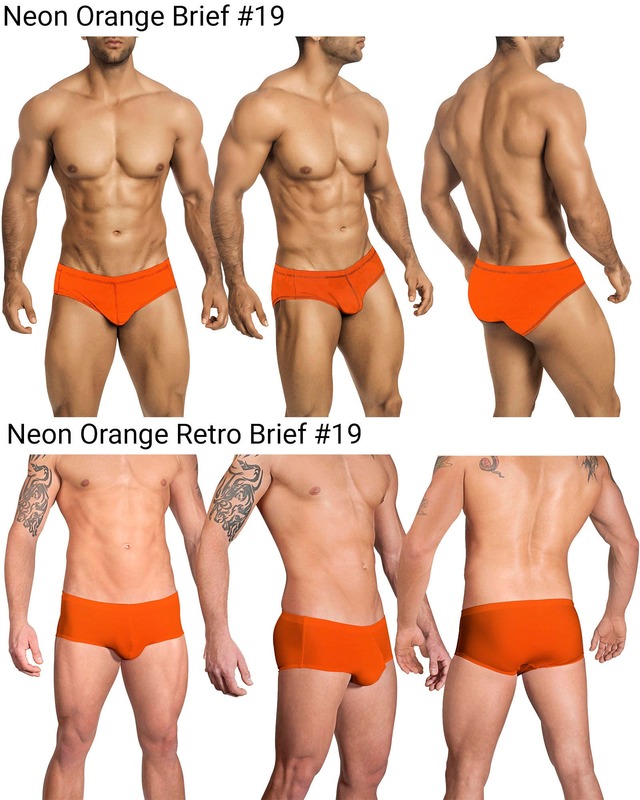 If you don't wish to take any chances on your swimsuit being too revealing when wet you can order a front lining for an extra $5 at checkout on all styles except boxer and board. Please note only the front pouch is lined, not the entire suit.